We provide laser users with a comprehensive range of retrofitable gold, silver, ceramic & doped glass cavities. In the majority of solid state YAG laser systems gold plated elliptical and close-coupled pump cavities are the preferred reflector used. Most optical pump cavities are typically produced from metals such as Aluminium, Stainless Steel, and Bronze. After machining the reflective surfaces are mechanically polished to mirror finish and depending on the base metal used a combination of under-plating is applied prior to the final gold plating process. We have developed a unique and proprietary gold plating process referred to as ‘LaserGold’. LaserGold plated pump cavities have been demonstrated to provide the highest reflective efficiency in the market. We provide a comprehensive range of retrofit and bespoke pump cavities. If your cavity is not listed or you require a custom produced cavity, please provide us with an original sample or an engineering drawing. Over the life time of the gold pump cavity the reflective efficiency will reduce due to surface damage, contaminant deposits and possible corrosion. Providing the reflective surfaces are not mechanically damaged, the cavity can be salvaged and re-plated. The contaminants, corrosion and remaining gold plating is chemically removed prior to repolishing the reflective surfaces and then re-applying the under plating followed finally by applying the ‘LaserGold’ plating process. 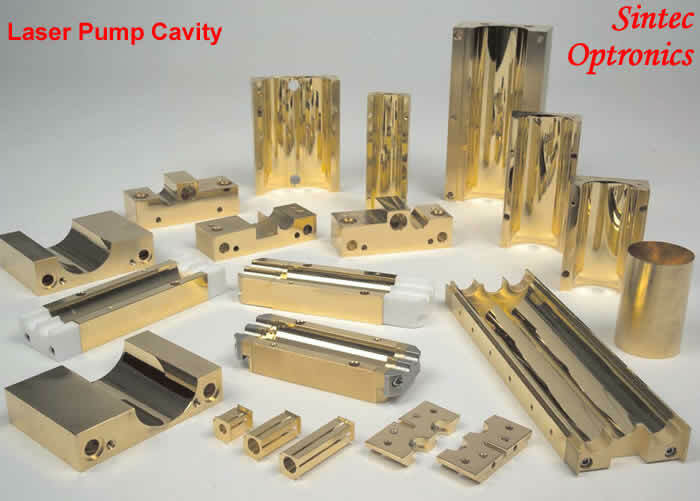 If your cavity is not listed or you require a custom produced cavity, please provide us with an original sample or an engineering drawing.